There’s no shortage of ways to back up your data to an external drive, a server or the cloud. But that doesn’t mean those methods will help you maintain operations after a disruptive event. Stick to solutions designed for business continuity and disaster recovery (BCDR). This will ensure your system is specifically designed to prevent downtime, minimize data loss and recover rapidly after a disaster. Sounds obvious, right? Well, you’d be surprised how many small businesses, right at this moment, are relying on cheap Flash drives to back up their most important data. Perhaps that’s why 43% of companies go out of business after experiencing a major data loss. Too many businesses are relying on inadequate backup methods that leave them vulnerable to a major disaster. USB flash drives and external desktop hard drives have their uses. For example, they can be good for excess storage and portability. But they should NOT be used as a business’s primary means of data backup. Your business continuity plan (BCP) will help you determine the right data backup solution for your business. A BCP is vital to understanding your risks for disaster and your requirements for recovery. It forces you to put your business’s recovery objectives on paper, thus guiding your BCDR decisions. Selecting a corporate data backup system without proper continuity planning will greatly increase the risk of deploying a system that doesn’t meet your needs. How quickly do you need to recover? How much data can you afford to lose? Recovery time objective (RTO): The amount of time in which recovery must be completed to avoid a major operational disruption; i.e. 1 day. Recovery point objective (RPO): The maximum allowable age of your latest data recovery point to avoid a data disaster; i.e. 8 hours. Your recovery objectives should be based on thorough risk assessments and business impact analyses (both of which should be included in your BCP). Setting these objectives will likely help you narrow your BCDR options significantly. SMBs are using more data, year after year. Make sure your data backup system can accommodate that growing storage need or be able to scale easily without major infrastructure upgrades. We recommend what’s called the 2-3x Multiplier Rule. Generally, your backup and disaster recovery (BDR) device should offer two to three times the total protected space of the agents you’ll be backing up. For example, if you’re backing up 1TB of data, your BDR appliance should be able to hold double or triple that amount. But since not all BCDR solutions offer long-term retention, you need to be sure you find a system that does. We’re not saying businesses should hoard their data like Grandma hoards TV Guide magazines. 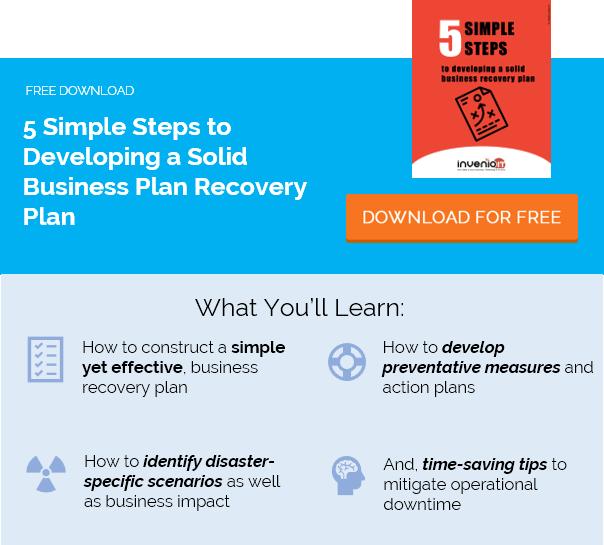 Just keep what you need to sustain operations after catastrophic data loss. Backing up to the cloud is a good idea for several reasons. Perhaps most importantly, it removes the risk of losing all your data in an on-site disaster, like a hurricane or fire. But also, when it comes to retaining your data for the long haul, Datto offers the option of Infinite Cloud Retention for businesses that need it. Businesses can store an unlimited amount of data in the Datto Cloud with no time restriction. To be clear, we’re not saying to store your data ONLY in the cloud—just as we’re not saying to store it ONLY on-site. When determining the best data backup solution for your SMB, look for systems that offer a hybrid approach. Hybrid combines an on-site BDR solution (for the fastest-possible access to your data) with replicated backups in the cloud (extra assurance for on-site data loss, plus the ability to recover files anywhere). In another post, we outlined the differences between incremental backups vs. differential backups vs. other types. But the technology we most recommend for most businesses today is Inverse Chain, a method innovated by Datto. Traditional backup methods are notorious for failure during the recovery process. But Datto’s Inverse Chain Technology results in more resilient backups by solving the most commonly occurring problems in the backup chain. Like normal incremental backups, it begins with a full back up. But then, each following incremental backup is stored in an independent, fully constructed state. There’s no rebuild process. Each unique block of data is saved only once and is then referenced by all the restore points that use it. This results in faster, more resilient backups and faster recoveries. When every second counts, look for BCDR solutions that offer faster access to your business-critical data and applications while you’re waiting on a full data recovery. Some solutions, such as Datto’s, enable your backups to be booted as virtual machines. That means you can continue running your apps in a virtual environment, from basically anywhere, within seconds. If you can’t afford to lose access to your data (as many businesses can’t), then virtualization is the way to go. A failed backup is an IT administrator’s worst nightmare. After a major data loss, nobody likes finding out that all the backed up data is corrupt and irrecoverable. Look for backup solutions that actively monitor your backups for problems. If your backups are bootable VMs, for example, they should be test-booted on a regular basis. Newer BCDR solutions automate this process, freeing up IT resources and eliminating the risk of surprises. With automatic backup checks, you’ll know if something’s wrong with your backups right away, not when it’s too late. We’ve talked about recovering data in a virtual environment and via full restores, but what about when you just need to recover a single missing folder? Human error is the leading cause of data loss. We’re all guilty (some of us more than others) of accidentally deleting important files and folders. And when that happens, you shouldn’t need to restore your entire backup to get those few files back. Look for BCDR solutions that enable you to quickly identify and recover lost files, without the need for a full restore. The more recovery options, the better: bare metal restores, diskless restores, hypervisor virtualization—these are just a few. Before you invest in a BCDR system, find out how many ways you’ll be able to recover data to ensure you’re protected on all fronts. Ransomware has become one of the biggest threats to business data today. While there are numerous strategies for defending against the malware (employee training being a big one), you can also get ransomware protection within your BCDR solution. The Datto SIRIS, for example, uses algorithms to automatically detect a ransomware footprint. For example, if large amounts of data are suddenly being modified at random, the system will say “Hey, this is probably ransomware.” The system notifies the administrator to revert to a backup from before the infection occurred. This kind of early detection can significantly curb an infection from spreading, thus preventing costly damage and downtime. Need some help finding the right data backup solution? Let us help you select the right data backup system for your business. Request a free demo or contact our business continuity experts at Invenio IT. Call (646) 395-1170 or email [email protected].